These two covered jars were described as bonbonieres when they sold in 2016. 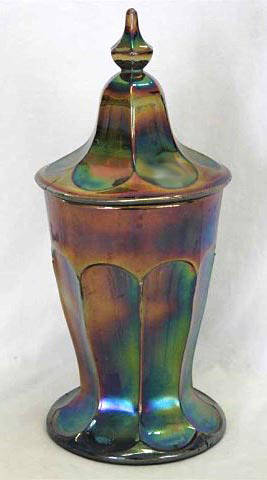 Glen and Stephen Thistlewood describe the shape as a lidded candy jar and 10 1/2 inch tall. They show illustrations of the shape in an Eda catalog. The example on the left is blue and sold for $750; the one on the right is marigold and had a nick on the edge of the lid. It sold for $275. 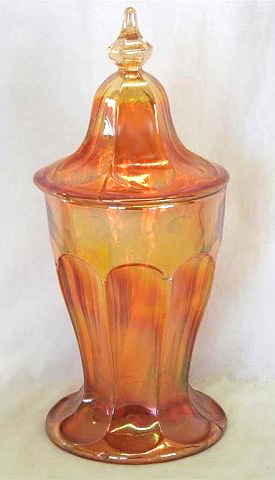 There is another shape called Grada vase, much like this one but without the lid. Photos courtesy of Seeck Auctions.